Changing bulbs requires a certain degree of practical skill. As a rule, you require a certain degree of practical skill to change defective bulbs. This applies in particular to those bulbs which are only accessible from the engine compartment. 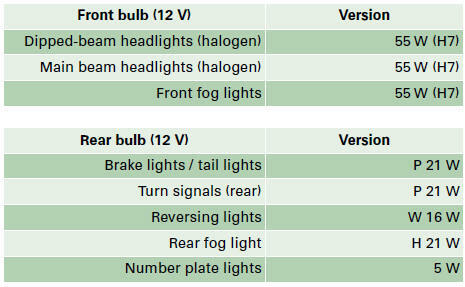 If in doubt, we recommend that you have defective bulbs changed by a qualified workshop or qualified mechanic. If you do decide to change bulbs in the engine compartment yourself, be aware of the safety risks involved ⇒ . You must only replace a bulb with a bulb of the same type. Information regarding e.g. the wattage can be found on the base of the bulb. • Take particular care when working on components in the engine compartment if the engine is warm - risk of burns! • When changing bulbs, please take care not to injure yourself on sharp edges, in particular on the headlight housing. • Always remove the ignition key before carrying out any work on the electrical system - danger of short circuiting! • Switch off the lights or parking lights before you change a bulb. • Take good care to avoid damaging any components. • Removing the lights in particular can lead to the paintwork becoming damaged. This is another reason why we recommend having the bulbs changed by a qualified workshop. Please ask your specialist retailer how to dispose of used bulbs in the proper manner. Place the parts you have removed on a soft cloth so that they do not become scratched. • Please check at regular intervals that all lighting (especially the exterior lighting) on your vehicle is functioning properly. This is not only in the interest of your own safety, but also in that of all other road users. • Before changing a bulb, make sure you have the correct new bulb. • Do not touch the glass part of the bulb with your bare hands, use a cloth or paper towel instead. Otherwise, the fingerprints left on the glass will vaporise as a result of the heat generated by the bulb, be deposited on the reflector and impair its surface. – Lightly press the defective bulb into the bulb holder, then turn it anti-clockwise and remove it. – Do not touch the glass part of the new bulb with your bare hands, use a cloth or paper towel instead. – Fit the new bulb, pressing it into the bulb holder, and turn it clockwise as far as it will go. – If necessary, use a cloth to remove any fingerprints from the glass part of the bulb. – Turn the bulb holder in the direction of the arrow A ⇒ fig. 287 as far as it will go and then take the bulb holder out of the light unit. – Insert the bulb holder into the light unit, making sure you keep the bulb holder straight, i.e. the rubber seal makes even contact all around. 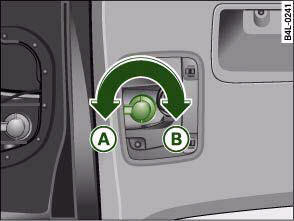 – Turn the bulb holder in the direction indicated by the arrow B ⇒ fig. 287 as far as it will go.